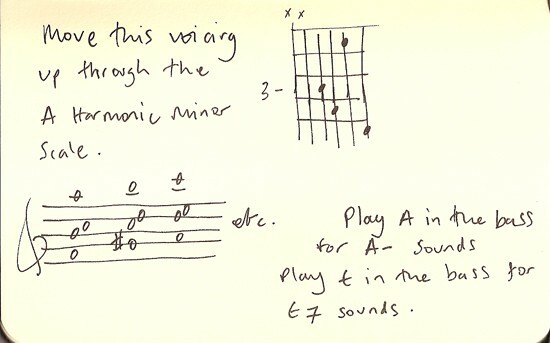 Here are a couple of my favourite harmonic sounds from the Harmonic Minor. Combine these structures to get the flavour of the whole scale. To get these voicings, each note moves up to the next note in the scale of A Harmonic Minor. So if you have an A, that would move up to a B. That would then move to C, to D, to E, and so on. You do that with all the notes in the chord at once and that’s a Chord Scale. Check out the notation in the picture and it’ll make sense. Use the open A to sound all the chords against and you’ll have a bunch of chords that give you an A Harmonic Minor sound. Some of them are more juicy than others. Use the low open E instead of the open A and you’ll have an E Phrygian Dominant sound. Change all the F naturals to F sharps. That’ll make the whole thing have an A Melodic Minor sound. Or change C to C sharp to make an A Harmonic Major sound. Or try changing A Harmonic Minor by changing B to Bb. Can’t remember what that scale is called: A Bb C D E F G# A. Or a major version: A Bb C# D E F G# A. The interesting thing is that you can use these sounds to suggest the sound of the entire scale. You don’t have to name any of these individual chords. Just think of them as structures from A Harmonic Minor, and combine them to get the flavour of the whole sound.